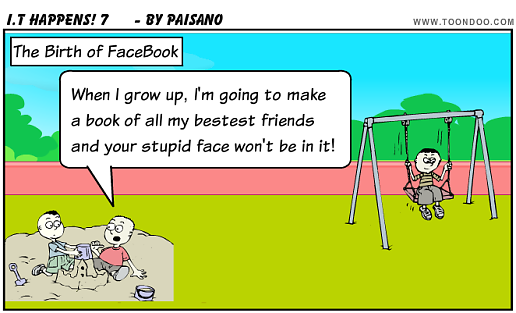 Posted by Doriano "Paisano" Carta in Comedy, Comic Strips, social networks. 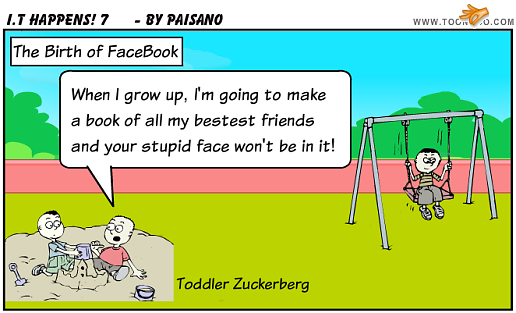 What strange coincidence that the two largest social networks, FaceBook and MySpace, both make the news this week. 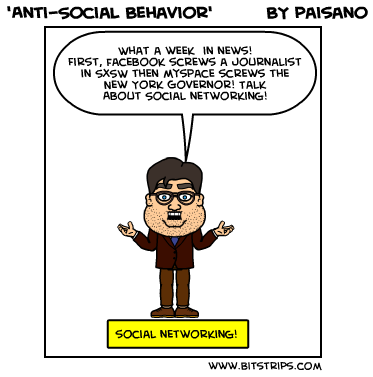 Posted by Doriano "Paisano" Carta in Comic Strips, IT Happens. Posted by Doriano "Paisano" Carta in Email. Most of us have multpile email accounts, which means multiple logins IDs and passwords and website addresses or email clients. Add to the mix all of the internal messages we receive such as on FaceBook and MySpace, which includes wallposts, comments and bulletins and we’ve got a virtual tidal wave of messages coming at us continuously. It is the digital age’s version of a juggling act. There is no way possible to check each and every email and social network account for all messages and respond in a timely manner. Fuser is trying to be the answer to this problem of message mania. Fuser will allow you to check multiple email accounts at the same time as well as all of the different types of messages that are sent from MySpace and FaceBook! Here is a list of everything it supports at this time. Note: It not only supports webmail accounts and social networks, but also your personal email accounts from your ISP and your work email such as from Microsoft Exchange. Believe it or not, it isn’t as slow or confusing as you think it would be. Sure, it is a herculean task to tackle, but it appears to work well. Reading and replying is similar to other webmail systems so there’s no learning curve there. It actually does a better job handling all of the social networking messages and bullitens than those sites do themselves because you can treat those messages like regular email. Final Thoughts: Fuser is unique and does a good job handling multiple accounts. I only used three webmail accounts and two social networking accounts for this test. I wonder how it would do if I added ALL of my email accounts. It has to bog down at some point, but for the average user I think it can do the trick. I think it will only get better with time too. Fuser can become a tool in our fight to control the avalanche of messages that come our way every day without an end in sight.